Our Dealer of the Month is Inland Truck Centre Kenworth DAF Wagga Wagga. We talk with Dealer Principal Cliff Swane. Cliff explains “The dealership occupies an 18,500 Sq metre site on the Sturt Highway in Wagga Wagga, in the heart of the Riverina and gateway to the productive Murrumbidgee Irrigation Area, and was completely renovated and extended in 2010 to incorporate 27 workshop bays, 4 fast service bays and modern Parts, Administration, Sales and Driver facilities”. When asked what is the highlight of the dealership, he replies “The complete renovation of the dealership of course but more importantly the recognition of our younger employees who have won numerous awards including State and national awards at WORLD SKILLS, PACCAR Sales Rising Stars, PACCAR Parts Top Gun, and multiple Apprentice of the Year”. 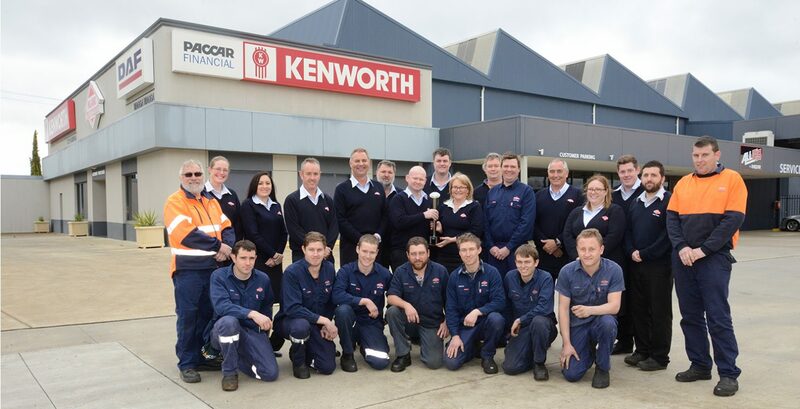 The unique thing about them is “The singularly dedicated focus on delivering for the customer by all our staff, which has resulted in maintaining a heavy truck market share in excess of 50% and their winning of the inaugural Kenworth customer support award for 2015”. Aboard the Gamefishing vessel Shaitun, especially on the continental shelf off Bermagui NSW. The current T909 is the most robust, reliable and durable truck we have in our area but I have got to say as a favourite the latest Australian built T610SAR has pipped it as my favourite product offering. Very lucky to be a second generation family business owner. If you were’s working in this industry what would you be doing? At home mowing lawns for Veramae (his wife) and chasing game fish on the few days she gives me off. My grandfather, he was successful and the hardest working and most humble man I have known. To see such tremendous achievement and dedication from young people as we do in our company. I am most proud of not one experience but the continual efforts our people put in for the customers and the great relationships they have with them. The most sparsely populated continent on earth and the large distances between the capital city population centres mean road transport has a great future. The industry does need to turn its head to investing in and attracting young drivers. Thanks for your time Cliff!